The first two towns were of no consequence (and only totaled maybe two-thirds of a mile), Guilford was great, and Madison gave me the Madison Blues. But we’ll get to that later. 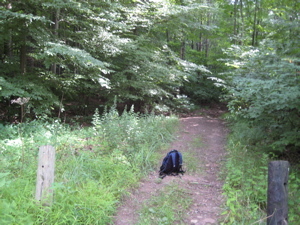 The exciting trail head off of Stagecoach Road! I attained the plateau fairly quickly, walking above some pretty impressive reentrants along the way. The plateau itself is very nice and expansive. 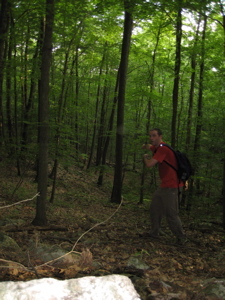 It also, of course, allows for some nice, fast, flat hiking. 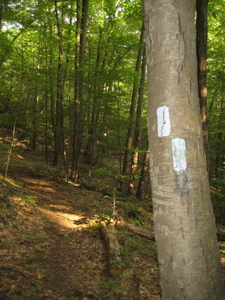 The trail meanders in and out of a few different Guilford Land Trust properties which all seem to contain some colorful and uniquely blazed trails. Fluorescents of all sorts abound – which for some reason I found tacky even though I know that doesn’t make any sense. 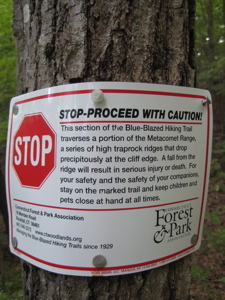 I stuck to my friend the blue blaze and approached the eastern summit of Totoket Mountain which is called Bluff Head. 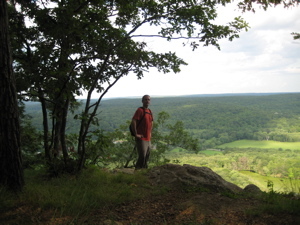 At 720 feet, this is the highest point in Guilford and is a very popular spot to hike. 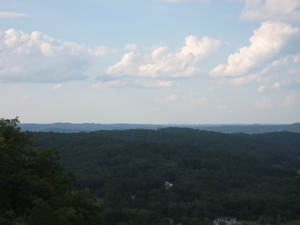 And now I know why – Bluff Head affords a grand panoramic view. Hartford is there. Look closely. 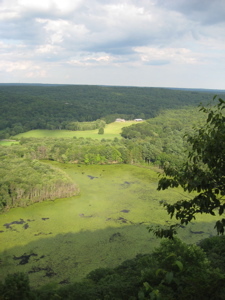 Before that harrowing descent, I took in the view of Myerhuber Pond. It is covered with either algae or lily pads or some horrible invasive species. This pond was dug by a farmer named Conrad Myerhuber using a team of oxen. I’m guessing that was at least 100 years ago and I’m not guessing when I say that’s pretty impressive. Also impressive? 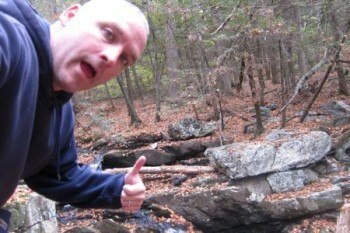 My newfound knowledge of the local geology. Why does it look like someone had their head bloodied on that tree? It’s here that the Eastern Border Fault separates the state’s Eastern Highlands from its Central Valley. 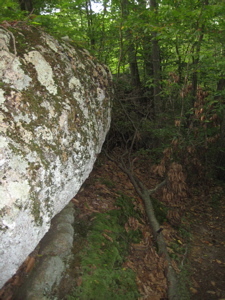 This fault forms the eastern edge of the Hartford Basin of Connecticut and Massachusetts, a large depression that formed within the roots of the Paleozoic Appalachian Mountains during the Triassic and Jurassic periods as North America separated from Europe and Africa, eventually forming the Atlantic Ocean. 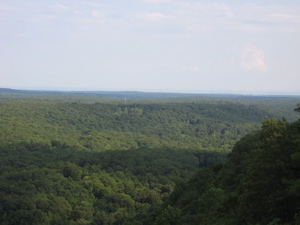 The trace of the fault and the contrasting types of rock found in the highlands and the valley are most easily seen in the vicinity of Bluff Head where the fault juxtaposes rocks that span more than 200 million years of Earth history. 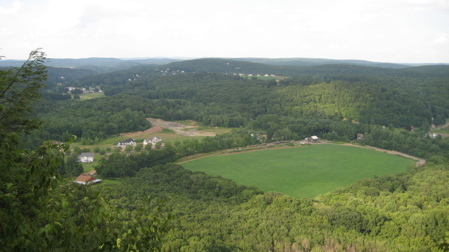 The massive exposure of the Jurassic Holyoke Basalt, with its typical trap rock structure, forms Bluff Head on the west side of Route 77. To the east, including the Broomstick Ledges parcel, coarse-grained Paleozoic schists and gneisses form the high ground. 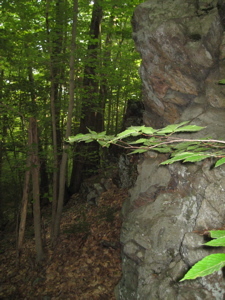 Pegmatite veins cut the Collins Hill Formation on this parcel forming prominent ledges characterized by coarse-grained mica, feldspar, and quartz. The geological history displayed here makes the land on both sides of Route 77 in the vicinity of Bluff head a particularly valuable cultural and educational resource. Agreed. It is very distinct and very noticeable – and very cool. Basically, to dumb it down for you, the rocks turn from brown to gray when you cross Route 77 going east. The blurb above mentioned something about the Broomstick Ledges. That’s the next area the trail passes through and while it’s really not all that exciting, it has a cool name and keeps the trail from being flat I guess. 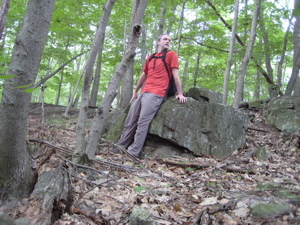 The Broomstick Ledges are sort of a poor man’s “Mile of Ledges” that can be hiked via the Tunxis Mainline Trail in Burlington (CTMQ visit here). In fact, try as I did, I never got a representative picture of the Broomsticks. My best Broomstick Ledge pictures. Sorry. For me, being much more of a geography than a geology nerd, I was more excited for the point on the Mattabesett just past the Broomsticks… Can you guess what it is? Me! 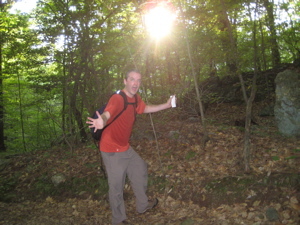 Enjoying the southernmost blaze of the whole Mattabesett-Metacomet-Monadnock Trail system! That last sharp turn northward righted me on my way to the Mattabesett’s end along the Connecticut River in Middletown. 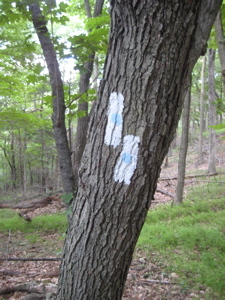 It also signaled that I was nearing another town on my day’s hike: Madison. Madison is a ritzy shoreline town with many multi-million dollar mansions. 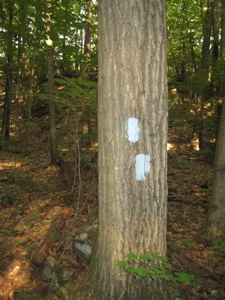 Unfortunately, the second the trail crossed into its northern woodlands, the trail immediately turned to junk. It appears this parcel will be gone soon; gone to the bulldozers and backhoes of progress. 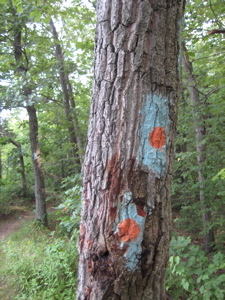 The trail itself barely survives this stretch, meandering among the crudely cut swaths of mud and orange flagged trees. I’m sure the giant houses that will be here soon will be lovely, and its not like this is exactly the finest natural wonder filled area in the state. 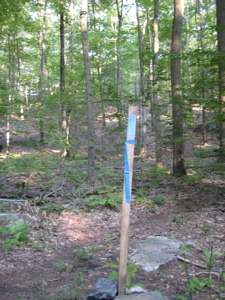 But it still left me with an ugly feeling when the blue blazes must resort to temporary plywood sticks in the ground. 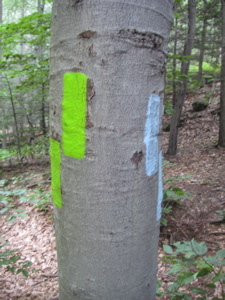 At least, as I neared the end of my Mattabesett section for the day, I crossed over into the Rockland Preserve. This 649-acre parcel will certainly be protected and that means the Mattabesett will survive through here, all the way up into Durham. 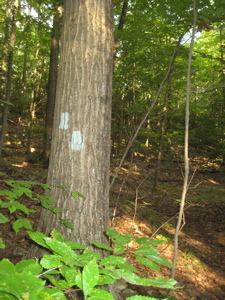 The Preserve is full of trails and interpretive signs and looks like a nice place to visit. I didn’t really have time to dawdle, though, as the sun was now dipping below Bluff Head and I had over four and half miles to go to get back to my car. (That’s the Lone Pine hike mentioned earlier.) 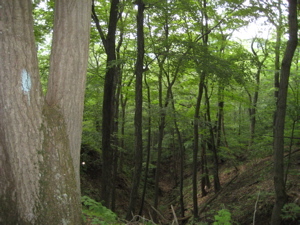 And so, despite the short developing area just over the Madison border, this is indeed a fun hike. And no, I’m not Bluff Heading. 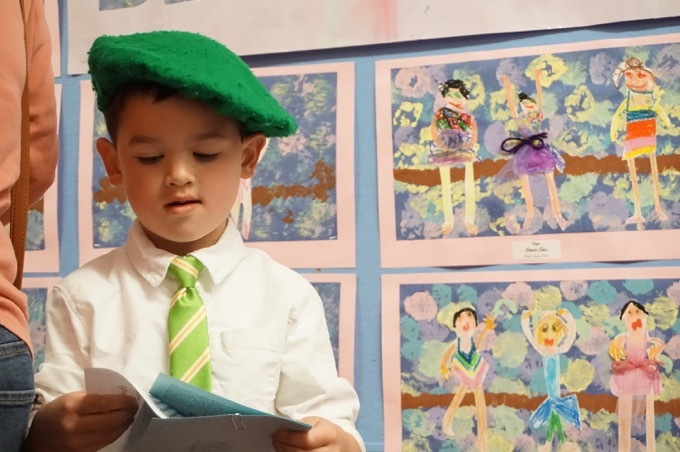 in the first picture you “vogued” – so ANTM. Just did a trail run through this section on Saturday. 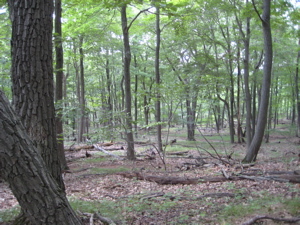 It appears that the economy, or some other influence, has stalled development of the denuded woods in Madison. 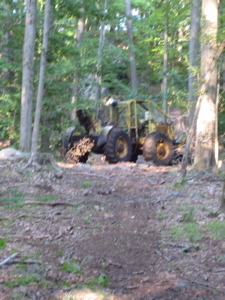 There was nary a skidder to be seen! Just completed the section from Route 68 to Crooked Hill Road (Lone Pine Trail). 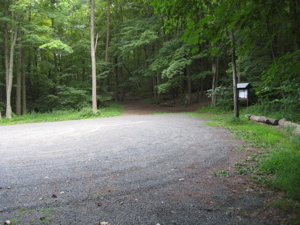 Finding a place to park off of Crooked Hill was a little tricky, but if you stay straight on Crooked Hill and drive down a narrow dirt road into the woods, there is parking for Rockland Preserve on your right. If you hit the house at the end, you’ve gone too far. Hiking back to the car (we hiked north to south) was a little tricky. 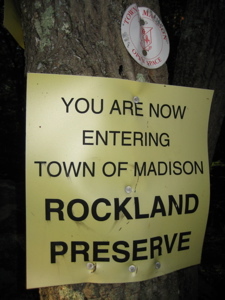 Check out the Rockland Preserve (Madison, CT) website for a trail map.